Hardcover, 6.75 x 9.5 in. / 92 pgs / 47 color. Lying deep within the urban metropolis of Hong Kong, Happy Valley is one of the most iconic racecourses in the world. 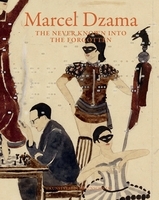 It is also the chief source of inspiration for a new body of work by American artist Marcel Dzama (born 1974). 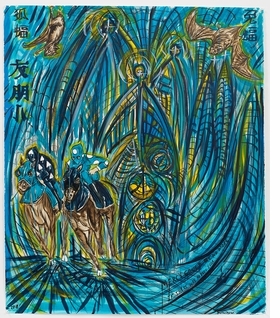 Jockeys ride through waves and cathedrals, Chinese symbols pulled from racing paraphernalia adorn the edges of paper, and bats swoop, hunting for prey. 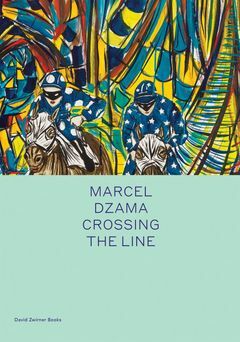 Dzama’s distinct visions of the racetrack come alive through a series of large-scale paintings and drawings, transposing imagery from his vast oeuvre into this adrenaline-filled sporting arena. His new works reflect on the culture of horseracing and how the track has become not only a symbol of sport, but also of commerce, class and wealth. 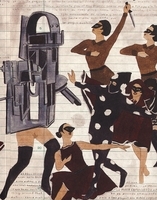 This publication includes a conversation between Dzama and Laila Pedro. 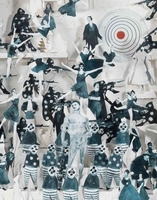 It is published on the occasion of his solo exhibition at David Zwirner, Hong Kong, in 2019. Text by Hans Christian Andersen. Interview by Lucas Zwirner. FORMAT: Hbk, 6.75 x 9.5 in. / 92 pgs / 47 color.